In November last year, Microsoft launched its new cloud-based solution Dynamics 365 on the North American market. Release in four more European countries is planned for this year. The Business Edition of the product, which includes Dynamics 365 for Financials (Project Madeira), is based on Dynamics NAV, but varies from the ERP system in many aspects. 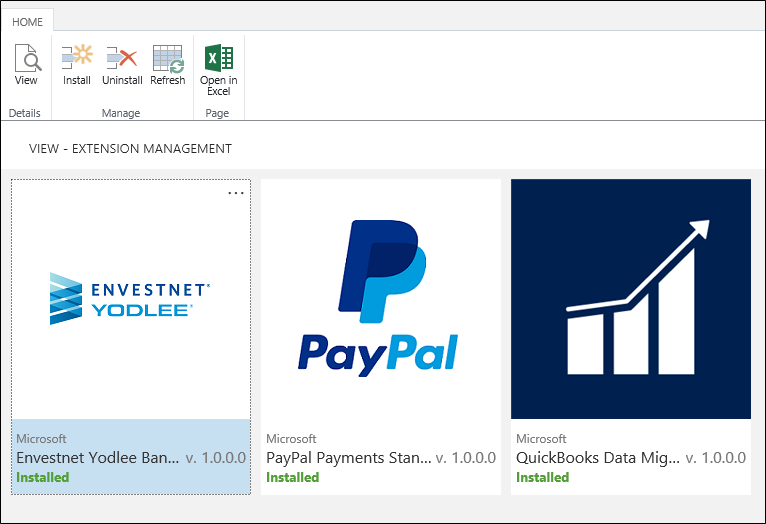 Although Dynamics 365 for Financials includes some of the functions of Dynamics NAV, it is not meant to and will not replace it – Dynamics NAV will be developed further in future as well. Unlike the latter, which can be run on-premise, via a private cloud or Microsoft Azure, Dynamics 365 for Financials is a purely cloud-based solution. Since the features of the platform are reduced mainly to basic functionalities of the financial accounting areas, sales and purchasing, it is particularly suitable for small and medium-sized organisations. The simplified functional scope, the high user-friendliness of the intuitive application, as well as assistants and tutorials ensure comfortable acclimatisation and quick understanding in Dynamics 365 for Financials – especially for beginners. Dynamics NAV, on the other hand, comes up with far more extensive processes and additional modules (e.g. assets, production, service and project module), but is also more complex in use. The flexible cloud platform Dynamics 365 for Financials enables to put the entire system individually together for oneself from various business apps and to adapt it to the requirements of the company, the industry or the role of the user. The corresponding applications can be obtained via Microsoft AppSource and can be supplied and used independently of each other. For example, you can start with a few fundamental apps and add more as needs rise. The solution deployed includes only functionalities that are actually required in day-to-day operations. Thanks to this flexibility of Dynamics 365 for Financials and the opportunity to implement changes and expansions even without the help of the IT department, it is possible to react quickly and easily to the constantly changing market or company conditions. Starting with the current 2017 version, the classic Dynamics NAV can also be expanded conveniently thanks to the extensions available. In addition, basic objects in NAV can be changed directly, thus allowing even the most customised adjustments. Updating the respective additional modules in Dynamics 365 for Financials and Dynamics NAV has different levels of difficulty. While Microsoft updates the applications acquired via the AppSource along with the basic application on a monthly basis automatically, extensions installed and basic objects adjusted in Dynamics NAV must always be migrated separately in the event of an update. In July, Microsoft released an update for its cloud-based solution “Project Madeira”. This offers the users some interesting new expansions in addition to a number of small improvements. The innovations mostly affect the interaction between “Project Madeira” and Outlook, the improvement of the sales documents and the connection to Dynamics CRM. Outlook now is equipped with certain new functions. From an appointment in the Outlook calendar, you can directly open the “Project Madeira” add-in, for example, in order to get an overview over the customer associated to the respective meeting. It is even possible to create and send an invoice for the appointment – without leaving the application. A further possibility is, to send e-mail attachments (e.g. 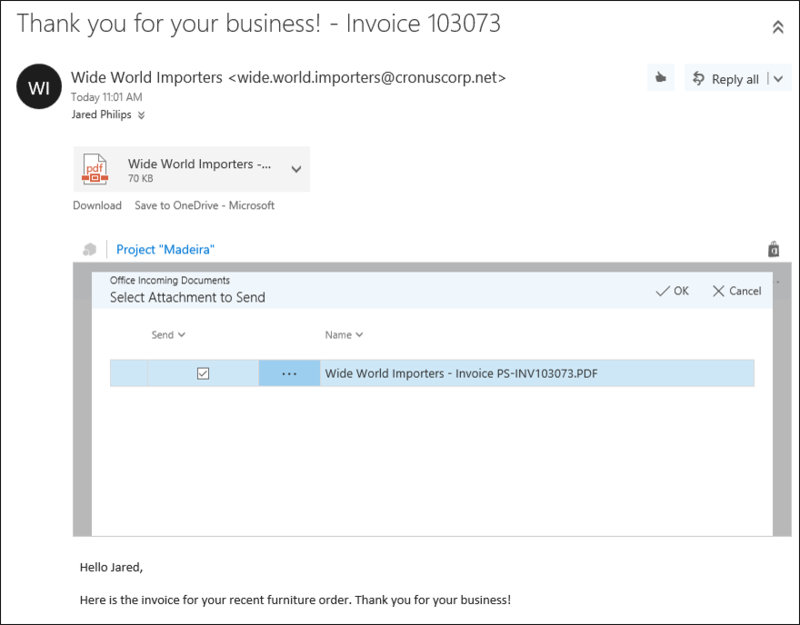 invoices as a pdf file) directly from the Outlook add-in to the list of “Incoming Documents” in “Project Madeira”. Then they can be forwarded to an OCR service which converts the received information into a digitally useable format. The entire process is carried out in the Outlook add-in. By the way, the user will also be informed there as soon as a software update is available. The sales documents in “Project Madeira” have been expanded with a number of important fields. The changes now allow information in relation to the transport service and the tracking number to be recorded, which allows a better traceability for the delivery of goods. Inventory articles can now also be labelled with various characteristics. The user can define his own types of attributes (e.g. colour, country of manufacture or size) and add these to the articles in addition to the built-in item characteristics. The inventory can subsequently be filtered using the various attributes. This makes the search for specific articles easier for both the user and the customer. “Project Madeira“ already contains basic customer relationship management and opportunity management. If the available functions are not enough, it is now possible – supported by a setup guide on the Business Manager homepage – to create a link to the Microsoft Dynamics CRM in order to use its comprehensive features (e.g. in the area of marketing and customer service). This means that data from “Project Madeira” and information from the CRM can be connected seamlessly. Further additional expansions can be installed via the “Extension Management” webpage. These include the verification and correction of all addresses in “Project Madeira”, as well as a simplified migration of data (e.g. customers, vendors and items) from Opera or Sage to “Project Madeira”.